Jose Gonzalez is the kind of guy whose excitement is contagious. Sitting in his music room at Sullivan Elementary School in Holyoke, in front of a wall full of haphazardly strewn guitars, he talks about his days back in his native Puerto Rico with gusto, with plenty of asides about well-known Puerto Rican musicians he's gotten to play with. Gonzalez is himself a Puerto Rican musician of note, starting his career with the well-known nueva trova group Taone. 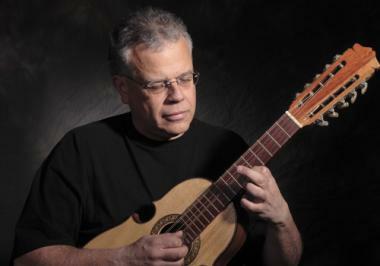 He moved on to form a duo, Cubano-Gonzalez, that played with the Puerto Rican Symphony. His pop band called Aura followed, and has been called a pioneer of Spanish-language rock in Puerto Rico. A move to New York made perfect sense, he says, when he realized staying on the island would mean only getting to repeat some of the musical dreams he had realized. Like many people, Gonzalez ended up in the Valley because of its proximity to New York and Boston. He's taught music here ever since. When he picks up his main instrument, the cuatro, you can tell he's an experienced musician—he doesn't tense up, doesn't furrow his brow in concentration, doesn't look down at his fingers much. Instead, he smiles, then sings, as if the conversation was merely changing modes. But his ease belies the dead-on accuracy of his timing, the certainty with which he fingers notes. Not that he's technically perfect—he understands, it seems, that the best playing is about more than that. Only musicians with years of playing experience can conjure that particular air of comfortable virtuosity. Gonzalez, a longtime Amherst resident, has put out 11 CDs of his own material with Criollo Clasico and Banda Criolla, and seems to have begun a dynasty of sorts, now that his two sons are playing as The Gonzalez Brothers (they also play in Orquesta Komboloko, MarKamusic and Sabor A Timba). All of the Gonzalez clan uses traditional Latin music as a starting point, venturing into rock and jazz improvisation in an exploration that's always entertaining to follow. The rock connection is particularly important in Gonzalez' playing. He's clearly listened to both Jimi Hendrix and jibaro, the music of the Puerto Rican mountains. When he plays me an example of traditional music, he transitions with a smile to Deep Purple's "Smoke on the Water." Somehow the cuatro carries that kind of power-chord tomfoolery beautifully, and it's the rock influence that's made Gonzalez' playing distinctive. The cuatro, the national instrument of Puerto Rico, sounds something like a cross between a 12-string guitar and a mandolin, but with a richness that's surprising for a small instrument. It's not as large as a guitar, but easily as loud, maybe louder. That is perhaps because cuatros are carved from a single large block of wood, whereas guitars are carved as separate pieces, then glued together. Gonzalez is an unusual connection to a world of music that's largely off the American radar, and giving his music a listen might well make your ears do something new. Gonzalez filled us in on his career in a recent interview. Unlike most interviews, the often careful back-and-forth of question and answer gave way with Gonzalez to a wide-ranging, freeform discussion. So what follows are some of Gonzalez' thoughts, organized by subject. In Puerto Rico, a lot of people consider me one of the top cuatro players… the reason for that, probably, is because my approach has been so different from theirs. Some of these guys play just incredibly. There's a lot of young guys who are just scary. But I think what has separated me is that I've taken a different path in the kind of music I write. I write a lot of my own pieces, and [in] what I don't write, my approach to classical and rock has been different. A lot of people don't play rock or classical on the cuatro. So when they go to one of my concerts, they always tell me, "I never heard anybody doing what you're doing on the cuatro." It's just my personality coming through on the instrument. You want to find an identity, and something to say. If you're playing with the Allman Brothers, you have an identity there. Some people are really great, but they spend all their life on a cover band, and you don't know—are you a blues player, are you a metal player, or acoustic, are you an old-time rock 'n' roller? For the purposes of getting a career going, it's hard when you do a little bit of everything. We've done mostly Caribbean music. We filter it through classical and rock. You can improvise on that, so it's similar to jazz. A piece like that is only three chords, but the idea is that all the cuatro players have to outshine each other. They invent all kinds of riffs. It reminds me a lot of the bluegrass kind of fiddling, those fiddling competitions. They have that too with the cuatro. This is the national instrument of Puerto Rico. There's the tres in Cuba, and for Andean music, they have the tiples, charrangos. … They all evolved from the Spanish guitar, when they came to the New World, at least for the Spanish-speaking countries, Latin America. Each country developed a couple of their own. This one, obviously, imitates the shape of the European violin. It's really interesting how, being a Caribbean instrument, it has so much from the classical world. They were definitely looking at the violin and the Spanish guitar, but they created this whole family of new instruments in the New World. This instrument goes very well with the color of the guitar—it's got a nice robust voice. You can play chords, you can go high like a mandolin. It's very versatile. The people on the island that I know, the top guys, everybody plays a little bit of jibaro, which is the folk music. That's evolved—it used to be that everybody who played this [instrument] would always just play it. It's like if you played banjo, everybody wanted you to play country or bluegrass. Now you have guys who like playing classical, doing classical tours. Just because somebody pulls out a cuatro now doesn't necessarily mean [jibaro]. It's really opened up now. A couple of weeks ago, I was traveling with a guy to New York. We were playing in front of Central Park. I remember picking up a cuatro from a friend of mine in his car and I tried to play it. Everything sounded so rock. I threw it in the back seat. I said, "I can't play anything. Everything I play sounds like rock and roll on it." I couldn't get away from my electric guitar playing. Now that I've done all these recordings and concerts, I had a friend who just told me, "Everybody has a different style. In your playing, I can pick out rock." I said, "Geez! I've been trying to hide that for years!" I have to struggle to really sound jibaro, mountain-type stuff, whereas other guys can't get away from it. I struggle to get close to that flavor, and some of these other guys say, "Man, everything I play sounds jibaro!" I started playing in the rock and roll era. The Beatles were huge, Crosby, Stills and Nash, Led Zeppelin. … I started playing mostly rock and roll drums. I got a guitar from an uncle, and the only reason, I think, I played it was they'd tell me, "Stop making noise in that room! That's it! Get off the drums!" I'd get angry, and I'd go grab the guitar. I think the first thing I ever learned was "Dirty Water" by the Standells, that little riff, over and over. Then they'd say, "Stop playing that now!" When I went to the University of Puerto Rico, I thought I was going to do medicine or something like that. I went by the music department one day and that caught my ear. I was playing music at home, and I found this world … I didn't even know you had music schools like that. Everybody's coming in with their piano players, people walking in with guitars, and everybody's doing scales, and I'm like, "Whoa! This is paradise here. This is what I do at home!" I was very lucky at the university that I got training. I was behind everybody, so I was getting Cs in music-reading. People were "arranging." I didn't know what "arranging" was. I had to catch up. It was a couple of tough years. I joined a band, a very popular band in Puerto Rico—I don't know how I got the break—as a drummer. And this band [Taone] was something like Crosby, Stills and Nash in Puerto Rico. We went to a lot of places—Mexico, Cuba—but I remember playing in Madison Square Garden with them, and here I am, very young, sitting in Madison Square Garden playing my drums! Hooking up with these guys ahead of you in your career lets you see what you can do. They were all writing their own music, so that became something very normal. You write your own songs, your own pieces. I had two fountains of nourishment. With the university, I had the academic, and I was up to date with the classical world. And at night, I'm on a [drum] stool in some clubs, similar to the Iron Horse. That was basically my music education.? I'd be driving down the road and hear my song between Chicago and Gloria Estefan. I felt like jumping out of the car! Jose Gonzalez y Banda Criolla play the Fine Arts Center Gala at the Hotel Northampton on Feb. 2 at 6:30 p.m. For more info and to purchase his latest CD, visit criolloclasico.com.